The crowdfunded remake of The Last Jedi has gotten even more crazy now that it has an epic poster. A certain section of fanatical Star Wars fans and a healthy dose of online trolls have started to raise hypothetical money to entirely reshoot Rian Johnson's film and it's gained quite the fan base over the last few weeks. The Last Jedi was released last December and quickly became one of the most divisive productions in the Lucasfilm world, with some demanding that it be stricken from the official Star Wars canon. So now, we have an epic poster for the crowdfunded remake of The Last Jedi that aims to fix the issues of the original movie in a facetious manner. The awesome new poster by Fro Design Company is limited edition and for sale on their website. Right away, Luke Skywalker has been "fixed." He's no longer the broken down suicidal hermit Jedi. 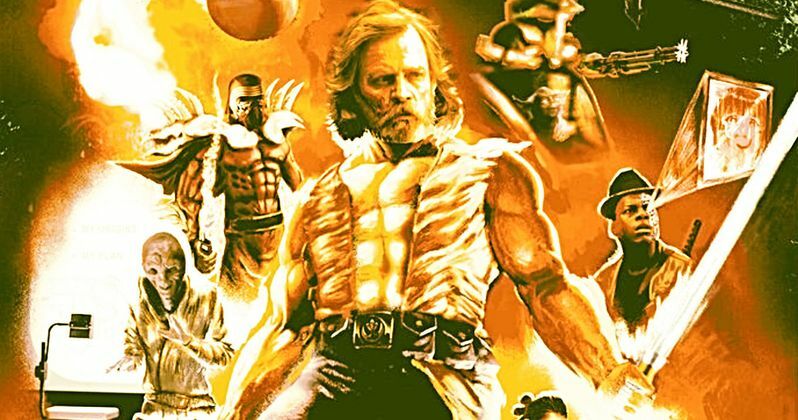 Instead, he's a buff dude with huge muscles and a ripped torso, leaving one to think that if this version of Luke went to Ahch-To, it was specifically to lift weights and bulk up. In addition to his trademark Lightsaber, Mark Hamill's Luke is also brandishing a giant gun. Speaking of Ahch-To, Rey is featured in the poster in a small role as a wife at home in the kitchen, cooking Porgs. A lot of the hate for The Last Jedi as well as the The Force Awakens comes from having a female lead, so this new fan-made poster puts Rey back in her "rightful" place. Carrie Fisher's Leia Organa has gone back to the bikini from Return of the Jedi in the new poster as well, back to the tough damsel in distress that Star Wars fans apparently want. On the villainous side, Kylo Ren is also just as buff as Luke Skywalker in The Last Jedi remake poster. His Lightsaber now looks like an intense flame while his armor has been changed up to gain some awesome spikes. Additionally, Snoke is back, but this time he's shown with an overhead projector to let Star Wars fans know about his backstory in what looks like a lengthy presentation. Elsewhere, BB-8 has an awesome Negan-style baseball bat, complete with barbed wire wrapped around it. If that wasn't enough, Boba Fett is back in the fan-made poster as the Millennium Falcon chases his Slave I ship away from a triple Death Star. To top off the crowdfunded remake of The Last Jedi poster, the new logo receives lightning bolts and a caption that reads: "A Film by a Bunch of Dudes from the Internet." Star Wars fans have finally gotten the version of The Last Jedi that they've been clamoring for, at least in poster-form. It's a true work of art and an awesome trolling of the trolls. Head over to Fro Design Company to order yours now and then check out the motion version of the poster below.